Uncasville is an area in the town of Montville, Connecticut, United States. It is a village in southeastern Montville, at the mouth of the Oxoboxo River. The name is now applied more generally to all of the east end of Montville, which is the area served by the Uncasville ZIP Code. In 1994 the federal government officially recognized the Mohegan Indian Tribe of Connecticut, which had historically occupied this area. That year Congress passed the Mohegan Nation (Connecticut) Land Claim Settlement Act. It authorized the United States to take land into trust in northeastern Montville for the Mohegan tribe's use as a reservation. Since gaining a reservation, in 1996 the tribe developed the Mohegan Sun casino resort. It has also built the Mohegan Sun Arena on their land. The Mohegan are one of the Native American peoples of the Algonquian languages family. Uncasville takes its name from Uncas, the 17th-century Mohegan sachem. The Mohegan, originally part of the Algonquian-speaking Pequot people, became independent through the 17th and 18th centuries; they allied with the English during the Pequot War of 1637. Uncas established a fortified village for defense, now known as Fort Shantok, on an elevated site next to the Thames River. He later welcomed English colonists to the Mohegan lands. The village of Uncasville became the site of the first woolen mill in the United States, developed by the brothers John and Arthur Schofield. Their carding and spinning mill was located at the mouth of the Oxoboxo River. The Uncasville Manufacturing Corporation operated on the river into the early 20th century, as shown in the postcard image to the right. In the 1950s the Olin Mathieson Chemical Corporation established a large manufacturing facility in the Sandy Desert section in northeastern Montville. In 1961, it formed a joint venture, the United Nuclear Corporation, with Mallinckrodt Corporation of America, and Nuclear Development Corporation of America. They started with a total of 1400 employees, producing nuclear reactor fuel components for the United States Navy nuclear program. The site was near Trading Bay. Some parts of the program ended by 1976. After United Nuclear ceased its operations about 1990, the site was cleaned up of environmental hazards, decommissioned, and released for unrestricted use. This was a redevelopment area as designated by the village. As colonial agents had sold land reserved for them, the Mohegan people had lost recognition as a sovereign entity. They sought federal recognition through the formal administrative process, submitting thorough documentation to prove their community and cultural continuity. At the same time, beginning in the 1970s, they were pursuing a land claim against Connecticut for having been deprived of their traditional lands. In 1994, the U.S. Department of the Interior granted federal recognition to the Mohegan tribe. Several months later, the U.S. Congress passed the Mohegan Nation (Connecticut) Land Claim Settlement Act. It authorized the United States to take into trust the United Nuclear site for use as Mohegan reservation lands; with this, the law also extinguished any other Mohegan land claims in Connecticut. In exchange, Congress approved the tribe undertaking gambling operations at the reservation site. With its own reservation, the Mohegan developed gaming operations to generate revenue for tribal welfare. They opened the Mohegan Sun casino on October 12, 1996, near the former Fort Shantok site above the Thames River. It has since been expanded into a large resort with hotels and other facilities. Uncasville village is located in southeastern Montville near the confluence of the Oxoboxo and Thames rivers. All of eastern Montville, located on the western shore of the Thames, is served by the Uncasville ZIP code, 06382, and is also known as Uncasville. The U.S. Census Bureau treats Uncasville village as part of the Oxoboxo River census-designated place. 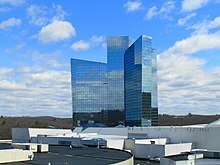 The Mohegan Sun resort is about 3 miles (4.8 km) north of Uncasville village. The Mohegan Sun casino in Uncasville, established in 1996, has become one of the largest casinos in the world. It has more than 250,000 square feet (23,000 m2). The associated resort complex now includes a luxury hotel, entertainment theater, and around 50 restaurants and 35 stores. The Mohegan Sun Arena, located in the complex, hosts concerts and live sporting events. It is the home of the Women's National Basketball Association's team, the Connecticut Sun and the New England Black Wolves of the NLL. ^ "Uncasville, Connecticut". Geographic Names Information System. United States Geological Survey. ^ a b c United Nuclear Corporation Naval Products Division, ColdWar-CT.com website, accessed June 11, 2011. ^ 59 Fed. Reg. 12140-01 (1994). ^ "Endangered Language Fund Board of Directors". Endangered Language Fund. Archived from the original on 2015-01-23. Retrieved 2013-08-04. This page was last edited on 31 December 2018, at 12:23 (UTC).